Special service for any kind of carpet/rug fabrics, focusing on maximum results. Wide Coverage in London, South East England and more. More than 19,000 new and happy customers till now. Offering our services for over 6 years, full of experience and returning clients. Contact us right now on 020 3404 5124 and get your special Discount, despite being a brand new or current consumer. What Makes our Carpet Cleaning Services Better? The latest cleaning technology and Eco-friendly solutions provided by Prochem™. We offer both home and office appointment at your convenience. Our professional teams are available seven days a week, working flexible hours to suit your schedule. Our trained cleaners are using only branded uniforms and vehicles, fully insured, IDs. Comforting advices and friendly attitude all the way. Feel free to ask for assistance or challenge our experts with your rugs at a time appropriate for you. We will make sure to do everything in our power and get the job done. 100% wool, cotton, silk, jute. Depending on the intensity of the spills and stains our cleaning specialists in London react accordingly. We choose dry and dry foam carpet cleaning, as well as hot water extraction. If we have an old oriental rug or delicate fabric, the process might be done by hand. For more information or further question you can contact us on 020 3404 5124 at any time. Our Carpet Cleaning services are available now across the city of London, so please call us on 020 3404 5124 or request a service online today! A team of easy-going and customer oriented specialist will help you make the fastest and free-of-cost appointment. Special, multiple order discount is also available! You can get in touch with as 24/7, no hidden charges or additional fees during bank holidays. Web chat support is instantly supported for you at our website, if you prefer it. Carpet cleaning – “The Friendly Cleaners know their profession very well. My carpets look like new and I'm very satisfied with the service as a whole. I recommend them proudly!" Carpet cleaning – “Friendly Cleaners definitely know how to clean my carpets. They make my floor coverings looking great and smelling fresh in no time." 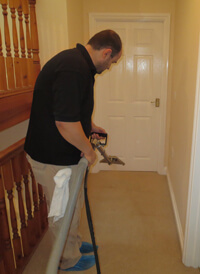 Carpet cleaning – “Everything was in perfect order from the booking of my carpet clean service to its very end. I thought that my old and worn out carpet will be a real challenge, but not for you cleaners. However after the cleaners finish the carpet was vivid and fresh. Thank you!"